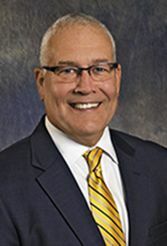 Mike grew up in Omaha, graduated from Archibishop Ryan High Schoo and has been a licensed Realtor since graduating from Wayne State College in 1976. After a successful sales associate career, Mike was named the Sales Manager of the NP Dodge Company's Dodge Street office in 1990. In 1993, Mike was promoted to President and General Sales Manager of NP Dodge Residential Sales Division. Mike and his wife, Cokie, have 4 children and 8 grandchildren.